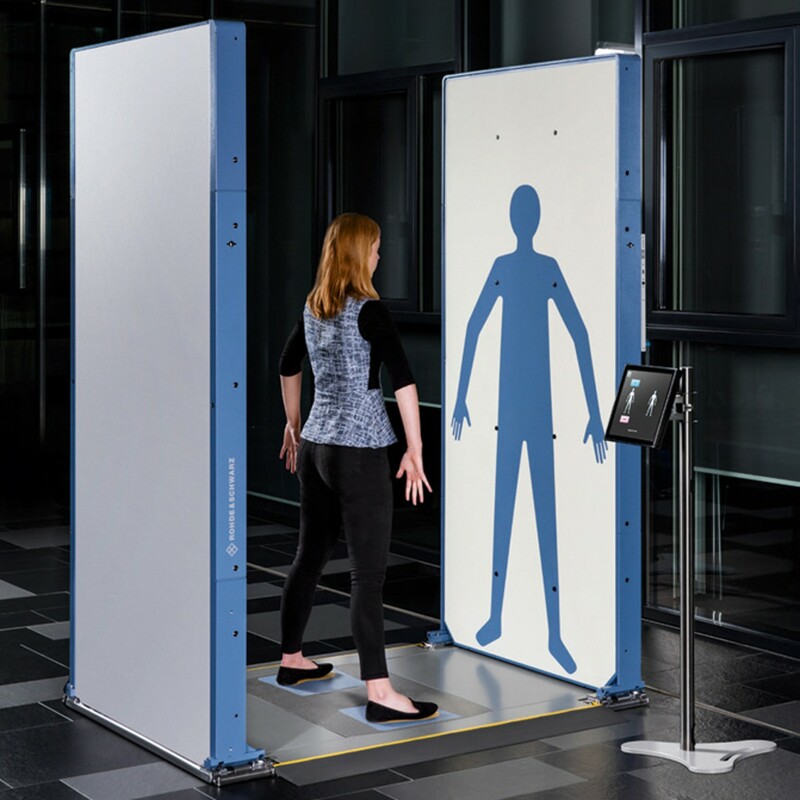 The R&S®QPS quick personnel security scanners are new, high-resolution security scanners designed specifically to make people screening at security checkpoints faster, more effective and comfortable. 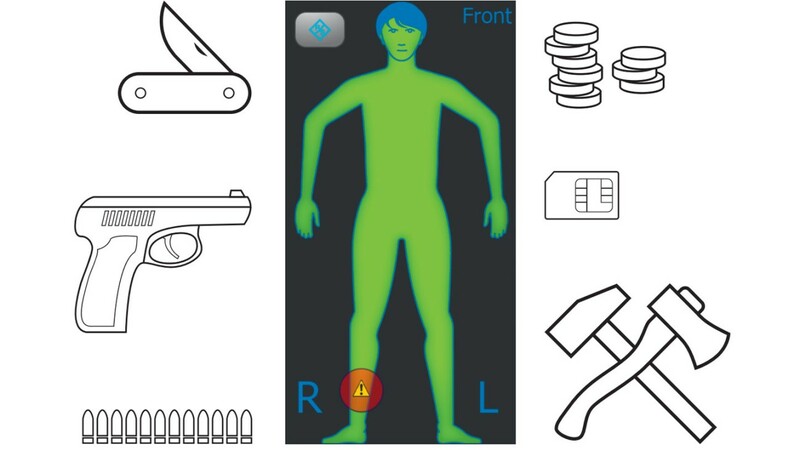 High-resolution detection of concealed person-borne threats and contraband has been a challenge since advanced imaging technology (AIT) was introduced in security screening operations in the US and around the world. Security operations have long demanded higher performance technology to support efficient checkpoint operations with the ability to detect an expanding range of threats and prohibited items. Today, the R&S®QPS quick personnel scanner technology provides high-resolution and high-performance enhanced advanced imaging technology (eAIT) security screening that is safe and effective. Most body scanning technologies today utilize either backscatter or transmission X-ray energy or, like the R&S®QPS, millimeterwave advanced imaging technology (AIT). Systems utilizing X-ray technology expose persons to ionizing radiation and are unable to see many optically opaque objects (including potential contraband or threat materials) because they appear transparent in the resulting images. The ability to see these opaque objects is a key benefit of millimeterwave imaging, making it attractive for a wide variety of commercial and scientific applications. Other advantages of millimeterwave technology is the non-ionizing radiation property and that it emits far less electromagnetic energy than a modern mobile phone or Wi-Fi routers. 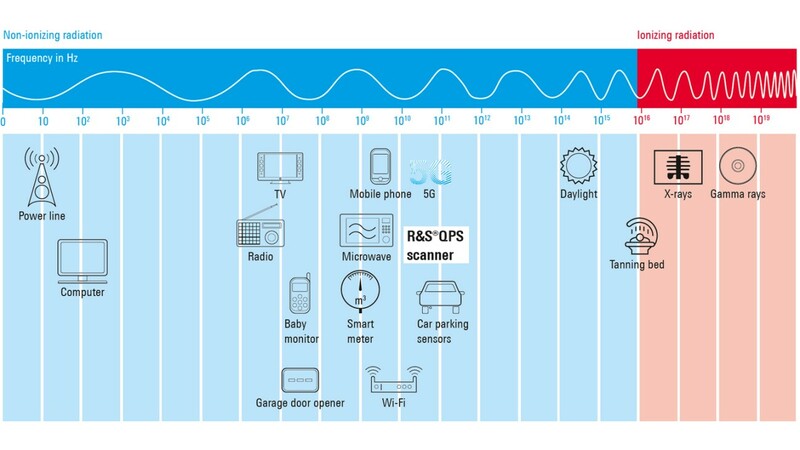 The electromagnetic spectrum: The 70 GHz to 80 GHz frequency band enables the R&S®QPS system to accurately detect and locate many objects that were transparent with X-ray technology. The enhanced advanced imaging technology (eAIT) used in the R&S®QPS scanner is much higher in frequency than legacy AIT technologies, enabling much higher scan resolution. It operates in the 70 GHz to 80 GHz frequency range, similar to the frequencies used by vehicle parking sensors. This frequency range enables a scan resolution of approximately 1.9 mm, approximately the size of the head of a match. 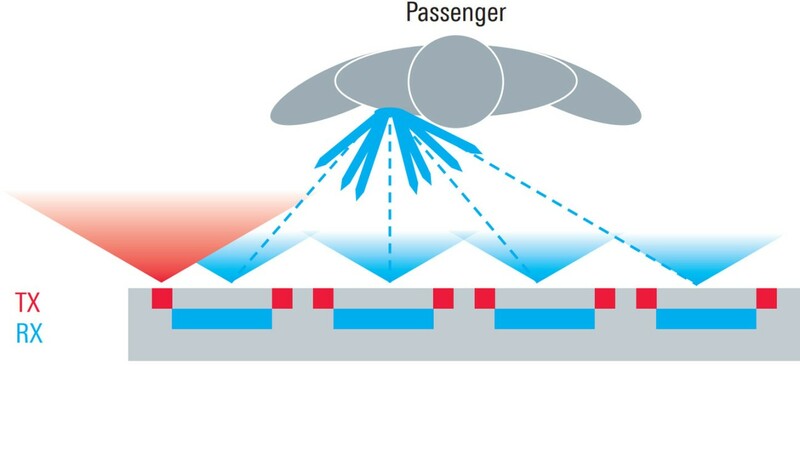 The small wavelength allows the R&S®QPS system to accurately detect and locate anomalies and possible security threats with better resolution than current technology, resulting in a higher probability of detection (Pd) and lower probability of false alarms (Pfa) than other security scanners. The R&S®QPS scanning system operates in quasi real time. Each panel contains an array of 3008 transmit and 3008 receive antennas. The scan process is a multistatic process where only one of the 3008 transmitters on each panel is active at a time and all 3008 receiving antennas capture the reflected signal. Since every transmitter rapidly steps through 128 frequencies before the next one starts transmitting, each scan cycle delivers more than a billion high-resolution measurements per panel, within 32 ms per panel or within 64 ms for a complete scan of the front and rear panels. This is five times faster than the blink of an eye. Passengers screening: With no moving parts, the R&S®QPS system collects over one billion measurement points faster than the blink of an eye. The fast scan time reduces the probability of an inadequate scan such as could occur in legacy systems if a person moves during their longer scan time. The multistatic process enables the flat panels to create a threedimensional rendering of results. The spatially diverse sets of antenna arrays and responses are combined with the digital backend processing to produce the results. The billions of measurements collected during the scanning process are combined to create an avatar for the security operator. The result is either a PASS if no anomalies are detected, or a symbol is placed over the location of the anomaly. system is capable of detecting emerging threats and much smaller quantities of materials than other systems in use today. This improved accuracy also reduces the number of time-consuming and invasive alarm resolution procedures (secondary security measures) that typically result from a large percentage of false positives. Unparalleled detection: R&S®QPS eAIT technology detects security threats with higher Pd and lower Pfa. The enhanced range resolution is a unique feature for the multistatic coverage of the R&S®QPS at close range operation. With the dual panel arrangement, the system can be utilized for a near instantaneous scan on both sides. To keep the security line moving, the results of scans with an alarm can be sent to one of up to four secondary stations for subsequent security measures, enabling the system to continue processing the next people in line. 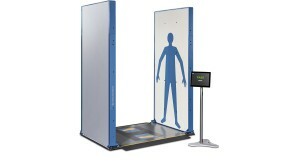 The open system design and comfortable scan pose improve the security check experience. The R&S®QPS differs from previous screening methods in how it looks, operates and performs scans. The tight enclosed spaces of legacy body scanners have become a thing of the past. The sleek, space-saving flat panels can be integrated into the checkpoint area without barriers. The open design gives security personnel an unobstructed view of the entire checkpoint. The scan procedure – often considered to be unpleasant in legacy systems that require people to hold their hands up in the air as if being stopped by police – is now significantly more comfortable and dignified for individuals. Arms are held slightly away from the body in a natural pose that is possible even for physically impaired individuals and is ethically appropriate across cultures.